Located close to Amersfoort’s World War II prisoner of war camp, Frank Pennink's plans for the Hoge Kleij golf course date back to 1979, but the architect died before its completion, so his partner Donald Steel finished the course, which opened for play in 1985. During its construction, a number of Bronze Age and Iron Age items were found on site, causing quite an archaeological stir at the time. The layout is named after the small hill over which some of the back nine holes are routed and it’s a fine tree-lined parkland course with fairways set on sandy soil close to the main road that runs to and from the east side of Utrecht. Architect Frank Pont of Infinite Variety Golf Design carried out some renovation work on holes 5 and 6 in 2005, enlarging both teeing areas and removing some trees that were encroaching on the fairways. Frank returned to Hoge Kleij between 2009 and 2011 to complete the renovation, which included the addition of new fairway bunkers, the installation of grass swales around a number of greens, the rebuilding of some tees and the resequencing of holes. 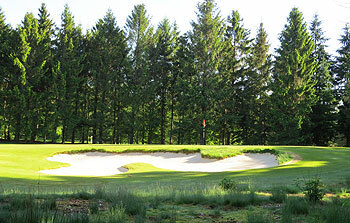 Additionally, the par five 12th has been extended from 480 metres to a mighty 550 metres. The new look De Hoge Kleij came into play in 2012 but course improvements still continue, with tree management a top priority for the club to ensure enough wind and light reaches the playing surfaces. Golfclub De Hoge Kleij is located just outside Amersfoort, within the Utrecht Hill Ridge region, less than a 15-minute drive from the Utrechtse Golf Club de Pan. When you’re situated so close to a world ranked course like de Pan then you’re going to lie in its golfing shadow somewhat but there’s no inferiority complex about Hoge Kleij as it’s more than able to stand alone on its own merits. I was fortunate enough to be joined on the front nine by Greens Chairman Joost Sträter when I played here last week, then architect Frank Pont walked the back nine with me. Both of them pointed out on a hole by hole basis the upgrade work that's been carried out during the last decade or so to refine what was already a really decent mid-1980s design from Frank Pennink and Donald Steel. Frank Pont has installed new ragged-edged bunkers and softened the green surrounds on many of the holes, creating swales and runoff areas around the mainly elevated greens whilst Joost has overseen the slow but sure conversion of greens to 80% bent grass and the thinning out and removal of trees to improve sightlines and encourage heather regeneration. Fairways weren't quite at their best when I visited because they'd just been sanded and slitted but that sort of inconvenience wasn't too much of an aggravation – nor should it be too big an issue with the membership if they realize the work is being done to promote the all-year playability of the layout. Hoge Kleij certainly isn’t resting on its laurels in terms of maintenance; a lot has been accomplished but there’s still more to be done. I liked the new green at the right doglegged par four 3rd which was moved back to accommodate the extension of the par five 12th hole, even though some might consider the runoff to the left of the putting surface a little too severe. I also thought the similarly contoured 6th green in front of the clubhouse could be another to divide opinion because of the extremity of the greenside swales. After playing a delightful little 3-hole loop in the most northern section of the property to end the front nine, the inward half is played out in a big, largely anti-clockwise loop round the southern perimeter of the course, traversing yet more pleasantly undulating terrain – I was a little surprised to learn there’s an elevation difference of around 100 feet across the course, which is an awful lot of land movement for any golfing layout in the Low Countries! Perhaps the perception in the past is that the top clubs in The Netherlands have been too private and unwelcoming – well that couldn’t be further from the truth in my recent experience. With the exception of only a few private new millennials, all of the Dutch clubs seem only too happy to accommodate visiting golfers, provided they make appropriate arrangements in advance. Such a welcoming open door is one that all serious golfers should consider walking through. Hoge Kleij just missed out on a Top 10 place in the national rankings for The Netherlands back in January of this year but it wouldn’t surprise me in the slightest if it managed to break into the top tier when the chart is next refreshed. A week last Friday I had the opportunity to pay my first visit to GC Hoge Kleij nestled in the sandy Utrechtse Heuvelrug not too far from Utrechtse Golf Club de Pan. The Utrechtse Heuvelrug is a rather large area characterized by sandy ground and heather much like the famous heathland area near London. It goes without saying that this area is tremendous natural ground for building golf courses. Hoge Kleij had developed a reputation for being extremely narrow and having been taken over by trees and bushes so my expectation was not too high even knowing that the architect Frank Pont had been busy renovating the course. I’m happy to say that I was very pleasantly surprised; the old photos I had seen of the course gave hardly any resemblance to what I encountered. Mr. Pont and the course committee have been fighting the good fight in taking drastic measures to clear away the bushes and have already cleared away many trees. It’s really a delight to see there is actually an excellent heathland course hidden in these trees. I hope for NL golf’s sake they continue in this direction as the course will only get better and better if they continue to remove trees and recreate the open heathland areas, continue the extensive heather restoration and keep making improvements to the course. From the white tees Hoge Kleij is a very tough test at 6,435 meters (7,000+) yds. If I look at the layout quite critically then I’d say they have a little more length than is necessary with 6 par 4’s over 400 yds, 3 of which are well over 430 yds. The other areas I would be quite critical about are the fact that nearly all the greens are raised and have run off on most sides. I would like to see more variety here. There are a few too many recovery shots that are the same. The last point I would be very critical on would be the fact that the fairways unfortunately have all been bulldozed flat when the course was built, rather than left natural to contain the wonderful undulations that you see in the wooded untouched areas that are so common to this land. My hope for Hoge Kleij would be for them to continue in the great direction they have started and eventually try to create some more variation in their green complexes and try to bring back some of that natural undulation to the fairways and of course keep removing trees. One last point that requires a line of it’s own. The large tree in the middle of the fairway on the 11th hole is a bit of a controversial topic. A seemingly perfect drive down the center of the fairway can easily result in a completely blocked approach shot and require only a high approach to access the green. The opinions definitely vary on centerline trees, I’m not a huge fan unless there is ample room to play around the tree or utilize it to increase the strategic options from the tee shot. In the case of this hole there needs to be some room created on the left hand side of the tree allowing for an approach that forces the player to flirt with the large bunker in the front of the green. The other renovations carried out all seem to have added tremendously to the course. The bunkering has all been changed for the better and they have adopted a more Mackenzie type natural blow out look. The bunkers look great in the setting so kudos to Mr. Pont, the greens committee and the green keeping staff. With this great progress Hoge Kleij is certainly making a run at becoming a top 10 course in The Netherlands and making a statement by bringing back the original landscape native to these beautiful heathlands. If only several other Dutch courses would follow this lead with aggressive tree/bush removal programs! My favorite holes would be the long uphill par 4, 4th, the par 3 14th and the short par 4 17th. Hoge Kleij definitely goes down in my book as a nice surprise, a course I’d recommend being definitely worth a visit and one I will keep my eyes on in the coming years. Fingers crossed they continue on the path they have started. This is a very nice track! it's still a pretty young course so it will only improve with the years. It's an exciting lay out that has some superb holes. It's not an easy course because it's really tight with narrow fairways. The conditioning is also a plus. The Utrecht area is blessed with some great courses, such as De Pan, De Goyer and Anderstein, that unfortunately isn't featured on this site yet.